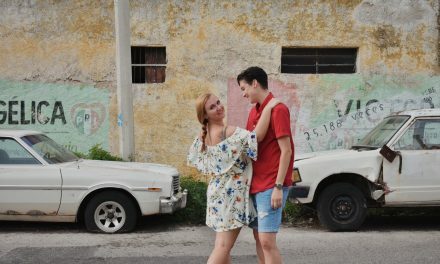 For Meg’s 30th birthday we partnered with Visit Austin and spent five days exploring Austin’s food, live music, great outdoors, and LGBT scene. Austin has been on our radar for a long time, we just hadn’t been able to make it work schedule wise. So when we were contacted by Visit Austin we were super pumped to get there. Because it was Meg’s birthday we splurged and spoiled ourselves just a bit more than usual. 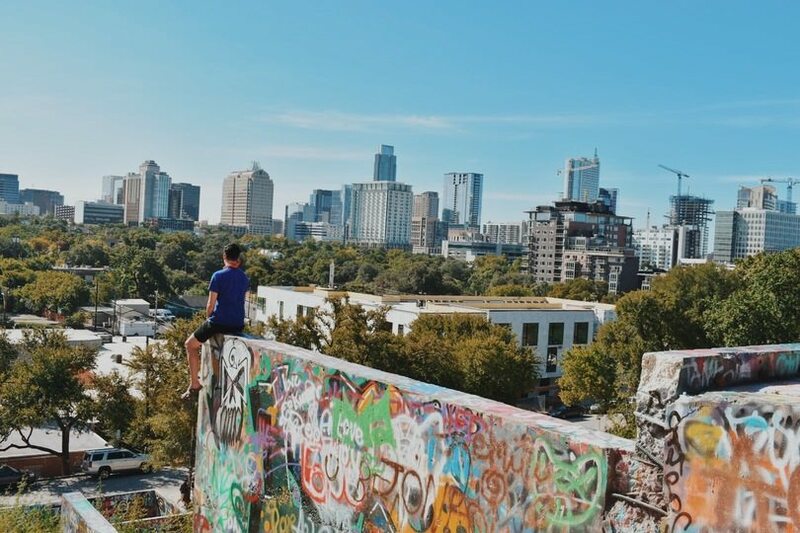 Check out our Austin guide for all the best hotels, activities, and restaurants to help build your Austin, Texas vacation. Austin is in central Texas and is conveniently located inside of a 3hr drive from Houston, Dallas, and San Antonio. The Austin airport was also just a quick ride from downtown. We flew in from Merida, Mexico with a layover in Houston both ways. The flight from Houston to Austin is only 26 mins leading two different flight attendants to ask why we didn’t just drive. If we were doing it again, we might have rented a car. Instead, we opted to use Uber throughout our stay. 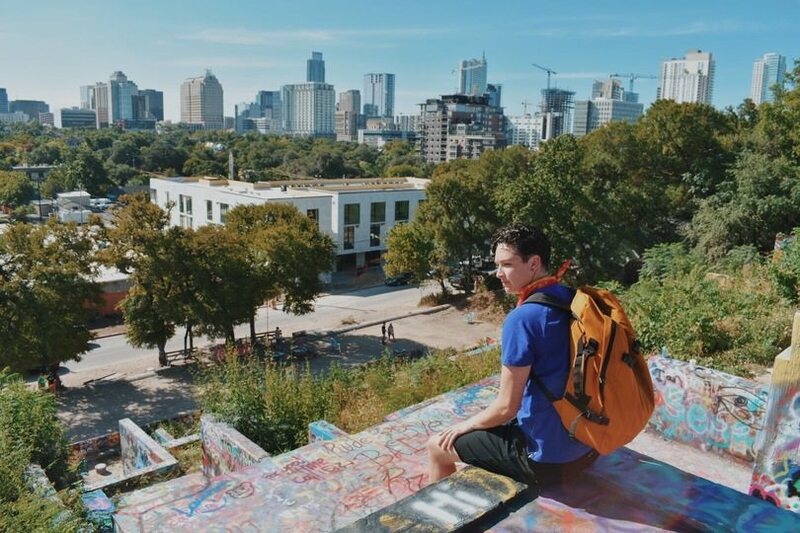 This is a stylish hostel is close to Lady Bird Lake and McKinney Falls State Park. 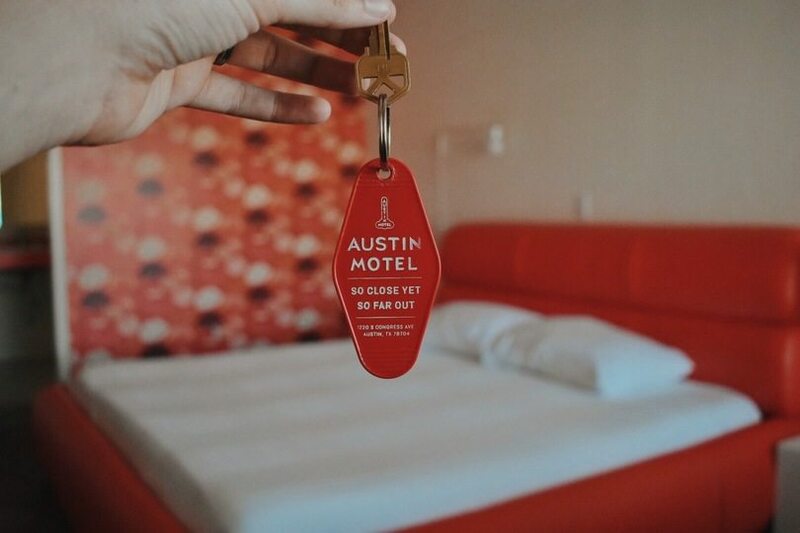 The HI- Austin has rooms that are dorm style with male, female and mixed room options. There is also a lot of shared space to hang out and make new friends. For $56 dollars a night you have a clean and comfortable space. The Austin Motel was the spot we called home base while we visited Austin. 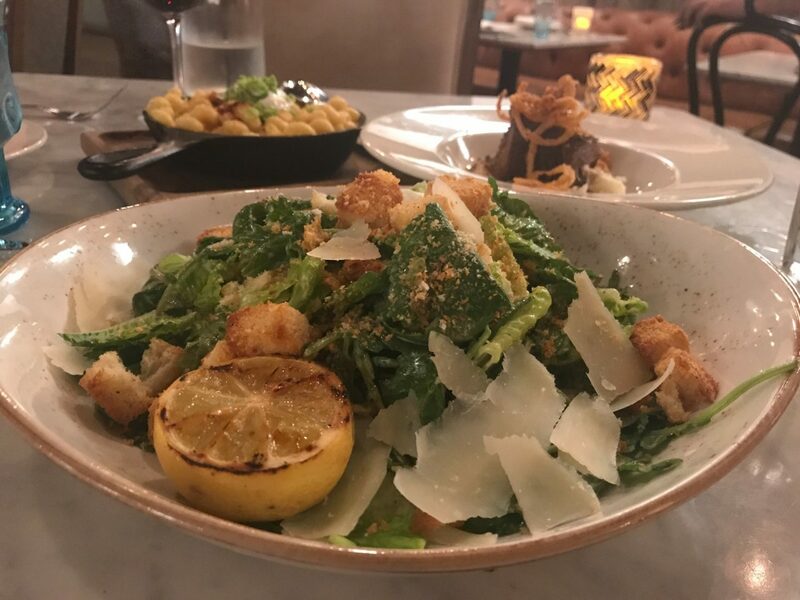 The location on South Congress was perfect for us with a short walk to vintage shops and tasty restaurants. The pool was also a welcome option as the temperature was in the triple digits throughout the stay (Bonus: it’s open til 10! Who doesn’t love a night swim). Each room was decorated with a bold retro wallpaper, brightly colored furniture and the MOST comfortable bed I have EVER slept in. Seriously, I kept talking about it the whole stay. The giant rainbow flag in the lobby window started our stay with a level of comfort that remained throughout our stay. 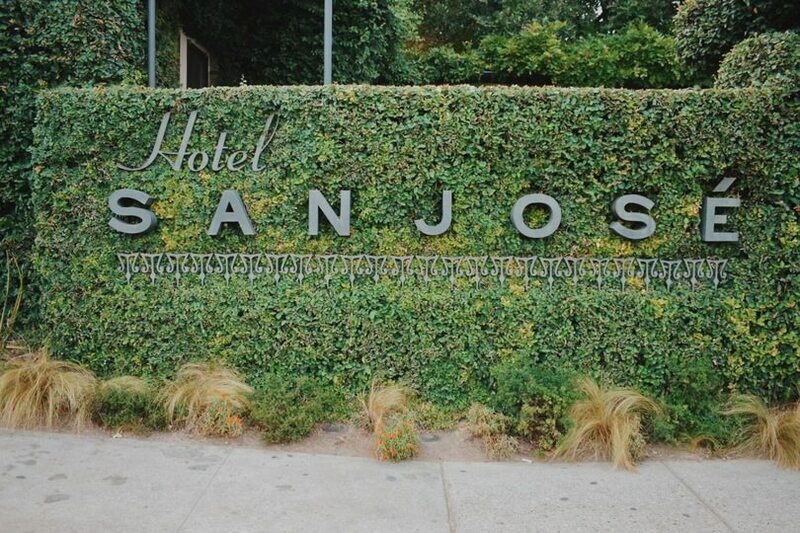 Located in the middle of great restaurants and cute shops you’ll find LGBT owned Hotel San Jose Austin Behind the gorgeous front walls covered in thick vines they have 40 urban bungalow style rooms. With lots of different room styles to accommodate whatever size party and very on trend amenities. With great views of South Congress Avenue, tons of hardwood and bright colored accents, the South Congress Hotel screams Austin to me. All the details are thought out. Everything you need is right at your fingertips. With multiple restaurant options right at the hotel, narrowing down where you’ll go for brunch might be difficult. Their Lobby Shop is also available for something you may have forgotten or to pick up some beautiful gifts to take home with you. Austin is considered the Live Music Capitol of the World and the Austin City Limits Venue is the center of that. The W Austin Hotel is located right next door in the 2nd Street District. 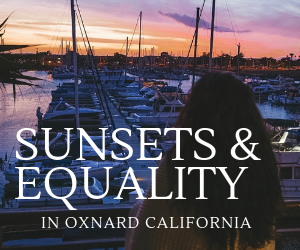 The location puts you within walking distance to over 50 shops, restaurants, and bars. When you stay here you are really in the middle of everything. 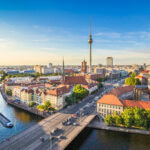 Airbnb can be the way go to when we’re looking for budget friendly or quirky accommodations. Austin without a doubt has the most fun option available without killing your budget. 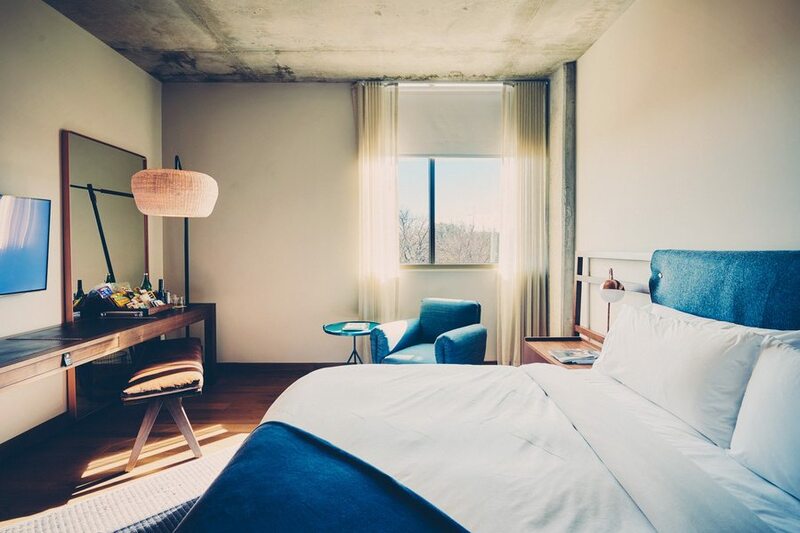 This chance to Experience Austin Glamping, with a firepit and outdoor movie theater- you might just want to stay in some nights. If you’re looking for something in a great location this one is 2 Blocks off Rainey, you’ll be within walking distance to shops, bars, and restaurants. Both spots are under $80 per night, freeing up some extra cash for the important things you know like like snow cones and BBQ. 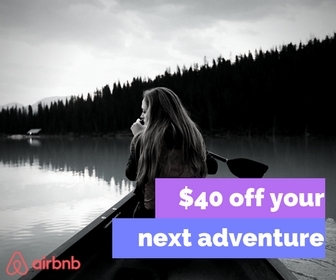 If this is your first time using Airbnb use this link to get $40 off your first stay. Meg quickly fell in love with the shopping in Austin. 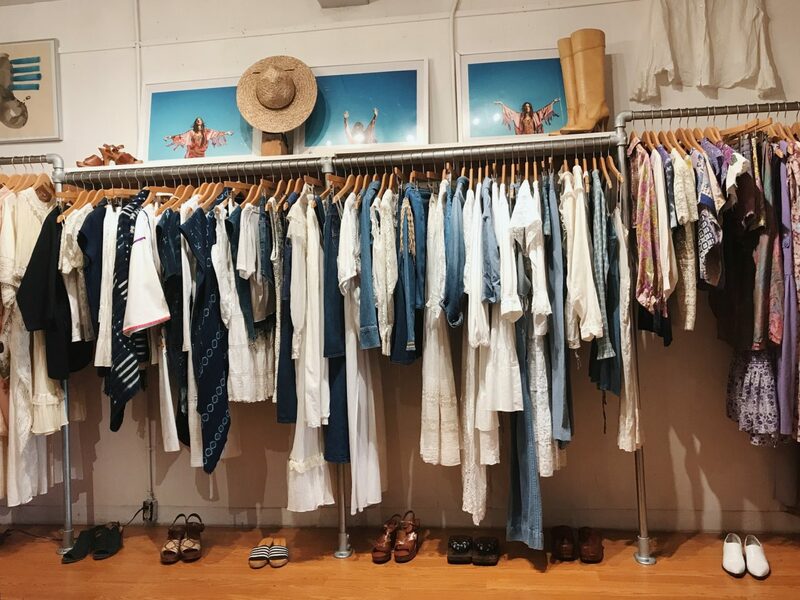 Boutique shops can be found all over the city with some of our favorites located on South Congress. Austin has a unique style and vibe that is directly reflected in the shops. 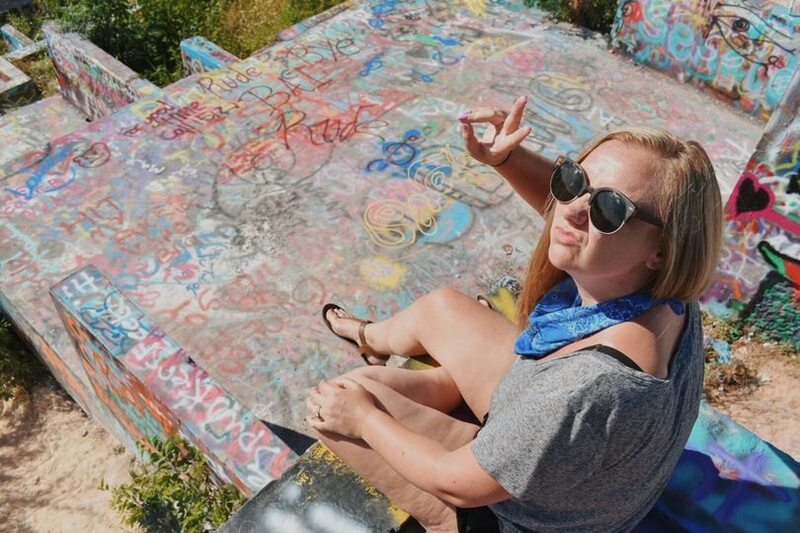 Meg quickly fell in love with all the available options and created her own Austin shopping guide. Some of my favorites were the Big Top Candy Shop, Lucy in Disguise with Diamonds and Uncommon Goods. A fun and unique way to get outside and see the city is to jump on the water. The views are great and being able to jump in the water on a hot day isn’t a bad option either. There are many options for places to rent the equipment. All of the outfitters offer guided tour options or you can just rent the equipment by the hour and explore on your own. 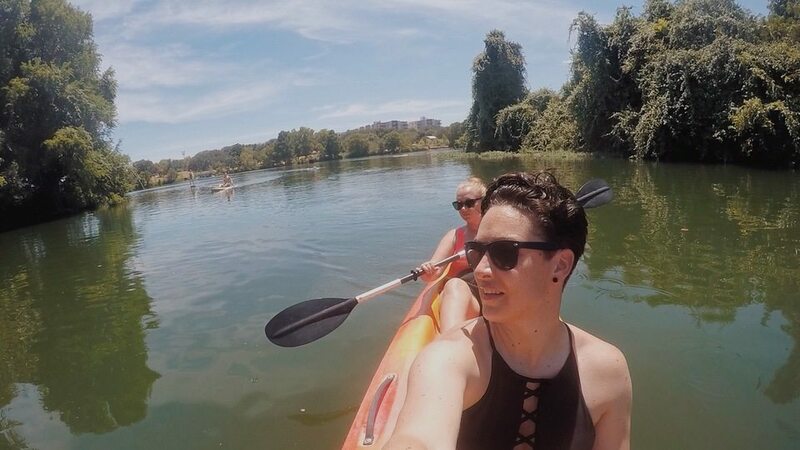 We went through Live, Love, Paddle and rented a tandem Kayak which was $30 for 90 minutes. At the last dinner of each of our trips Meg and I always list our “top 3 experiences”, kayaking made both of our top 3. In the evening from 8-9pm, you will see large groups of people on the South Congress Bridge. Both locals and tourist are there to watch the bats leaving the bridge to eat the insects of Austin. Roughly 1.5 million bats call this bridge home during the summer. For a really unique view, you can take a guided kayak tour and sit on the water to watch them fly out as the sun sets. The amount of live music in Austin is mind blowing. It seems like everywhere you turn you hear music playing. At almost any time of the day in any part of the city, you can find live music. It is a part of the fabric that makes Austin, Austin. Places like Cheer up Charlies, The Scoot Inn and the Continental Club are great options. You can take one look at either of our Instagrams and you’ll know Meg and I love street art. Finding creativity spilling out in the back corners of parking lots, sides of buildings the cracks of sidewalks is something that excites us. We went to multiple different neighborhoods with the purpose of finding a specific mural. There is also HOPE Outdoor Gallery, a three story pseudo building covered in tagging. You can climb, take pictures and even bring paint to contribute to the art if you register in advance. The gallery is constantly being painted over and changed. Every inch of every wall is colored in paint. It is an inspiring place to be. We quickly learned that in Austin eating BBQ is an experience as much as it is a meal. We showed up wildly under prepared for our experience. Three things we did wrong so you don’t have to. 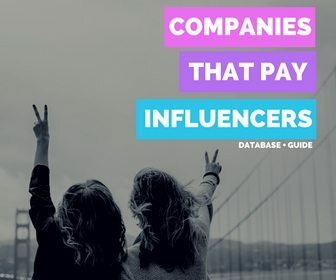 The wait can be long especially if you hit the well-known spots like Franklin Barbecue and La Barbecue so just go prepared it will be worth it! We showed up mid day in 104-degree weather and were told there was at least an hour wait. We were obviously tourists. The locals came prepared. So bring something to drink, lots of people in line with us had coolers full of beer just for the wait. Bringing a lawn chair isn’t a bad idea, seriously the wait could be that long and it’s hot. Don’t go at the hottest part of the day. Don’t skip the brisket, Central Texas BBQ is all about the brisket cooked low and slow. At this fun spot, you can watch and movie and have a couple drinks. At the Alamo Drafthouse Cinemas, you can have dinner and a movie all in one seat. It is a unique experience for movie lovers or anyone that’s just looking to chill and escape the heat. They even have designated nights when you can go and yell out the quotes to some of your favorite titles, like Rocky Horror. Barton Springs pool is located in Zilker Park. 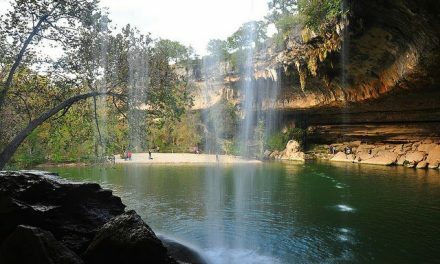 It is fed from underground natural springs and was formed by damming a creek so it has a natural stone bottom. The water is, uh let’s call it a refreshing 68-70 degrees year round. When we walked in we overheard a girl telling her friends “Don’t dip your toe in or you’ll think it’s too cold. You just have to go for it”. We ignored the advice, dipped our feet in and then spent 15 mins debating if we were really going to get in. In the end, it was 102 degrees out so of course, we went for it! 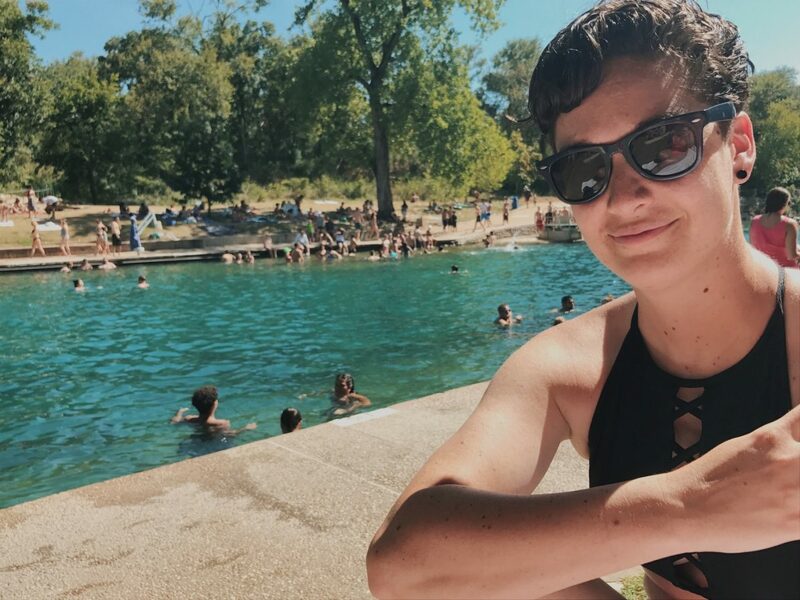 Barton Springs was one of the highlights of our trip. You could spend multiple nights popping in and out of bars along Rainey and East 6th Street. There are some many options the right combo of beverage being served and music playing is available you just have to find it. We have a local tell us he’s been there 5 years and his favorite nights are still the ones where you have one drink at multiple spots. We did find some favorites of our own. 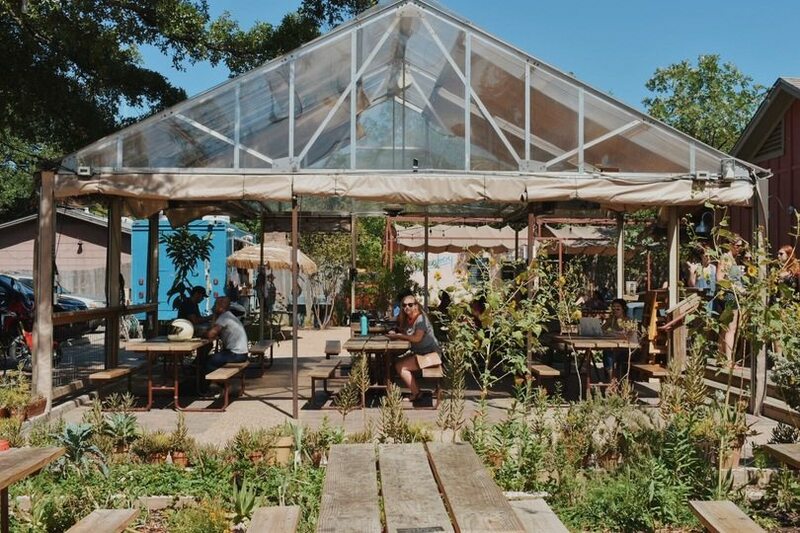 Serving up fresh squeezed juice cocktails, local beer, and tons of live music Cheer Up Charlies is your go to Austin LGBTQ Bar. They have live music almost every night and tons of theme parties. 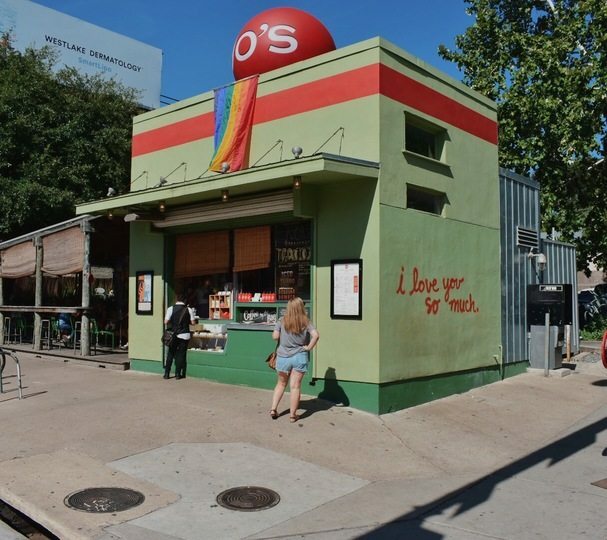 After we visited we talked to locals that all gave rave reviews saying that Cheer Ups is the queerest spot in Austin. Located in the heart of West 6th street the Kung Fu Saloon is so much fun. Have a couple drinks and play all the games! They have vintage arcade games, skee ball, and Jenga. I love anything competitive so Kung Fu Saloon was one of my favorites. Is a gay dance club with lots of space including an outdoor patio. They have great daily specials as well as a weekly drag show. Oilcan Harry’s also has frequent theme nights for you to have fun with. 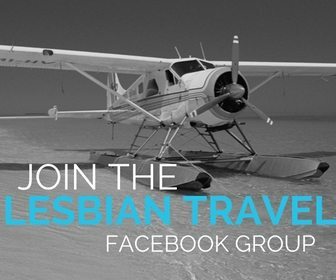 While it’s mostly gay guys who hang out here, they’re welcoming of all. We flew into Austin after spending two weeks in Mexico and talked a big game about staying away from Tacos in Austin. In reality, we went straight to Guero’s Taco Bar because it smelled so good. Meg had Fish Tacos ($11.29) topped with shredded cabbage and chipotle tequila mayo. I have the Brisket Tacos with rice and beans. They also served fresh juice ($2.30 a glass) or fresh fruit smoothies ($4.59). It was a great first stop but we spent the rest of the week questioning if it was okay to go back and eat there a second time. 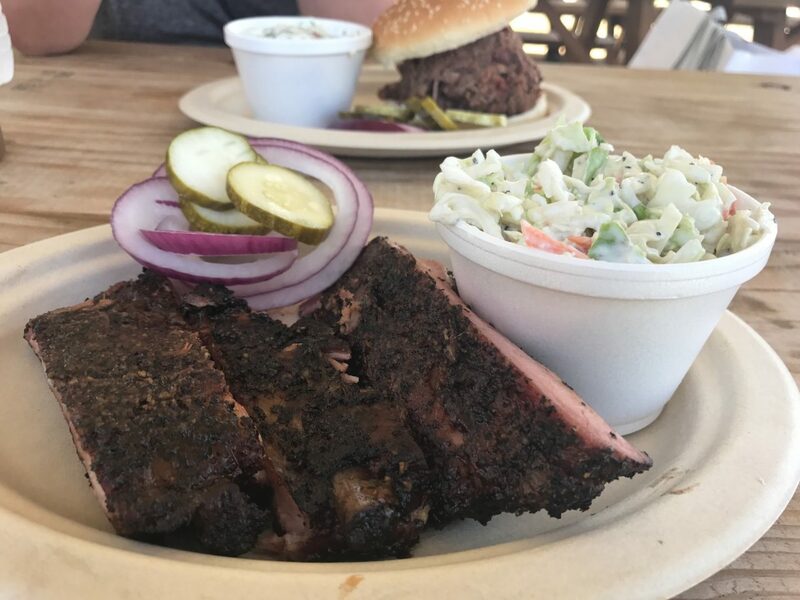 This popular lunch only Texas Barbecue spot consistently is considered an Austin favorite. Get there early and expect a very long line to get Brisket ($22 per lb) and Pulled Pork ($19 per lb). 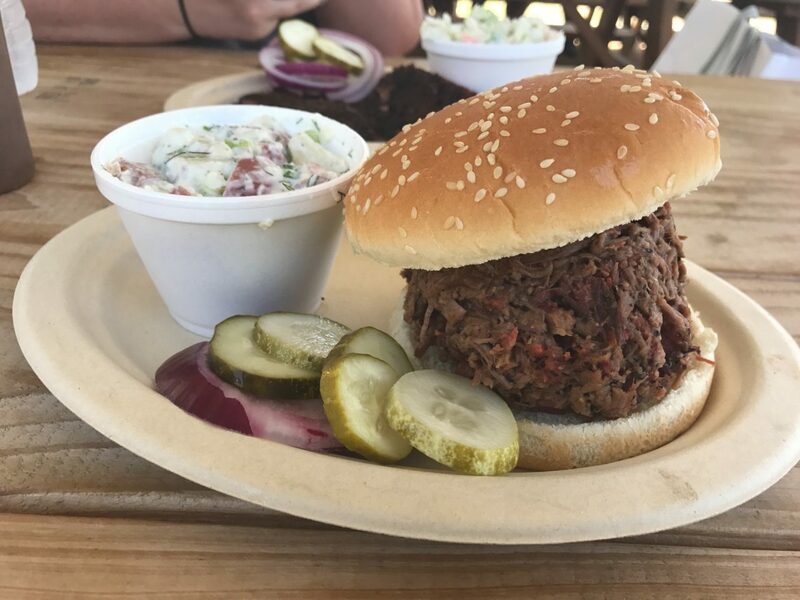 Melt in your mouth brisket is worth it even if you have to bring our lawn chair along for the wait. Franklin Barbecue is an authentic Austin experience. Barley Swine is all about the local ingredient. It is an upscale restaurant with a true foodie feel. The menu is constantly changing based on what is seasonally available and the chef’s creativity. They strive to create excitement with their food that will translate into the guest experience. If you’re up for a little adventure they do off a 10 Course Chef’s Tasting. Seersucker is an upscale eatery with a lovely wine list and the small plates program. Try them shared or order independent entrees. The Beer Braised Short Ribs ($13) and Mac n Cheese ($13) were the highlights of our meal. We ordered small plates so we could try a bunch of things. The food was delicious and the portions were outstanding, our eyes were certainly bigger than our stomachs. 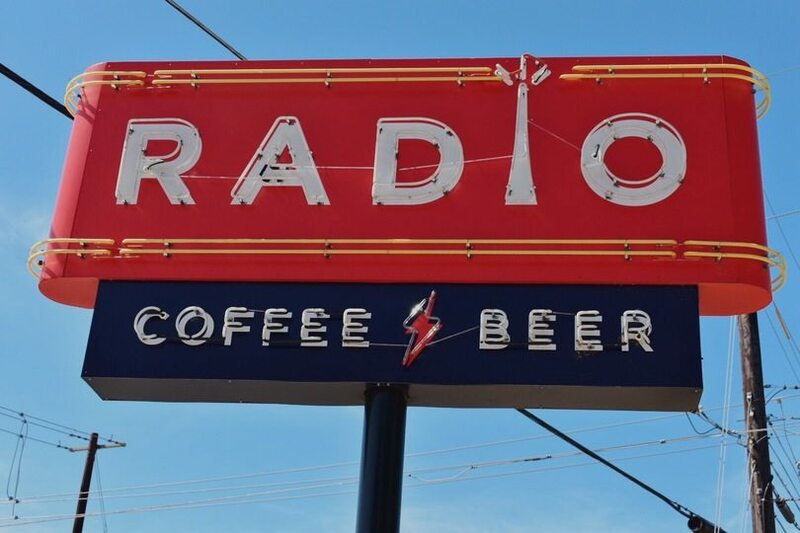 Radio Coffee and Beer has gorgeous outdoor seating that is dog-friendly with space to wander. Any place that serves coffee and beer in the same spot is a pretty great option. When you mix two delicious food trucks parked outside you get the perfect combo. Veracruz Tacos serves tacos, quesadillas, and tortas at super reasonable prices. We went in the morning and so we both had breakfast tacos. Meg order tacos filled with ham, egg and cheese and I got chorizo, potatoes, and cheese ($2.50 each). 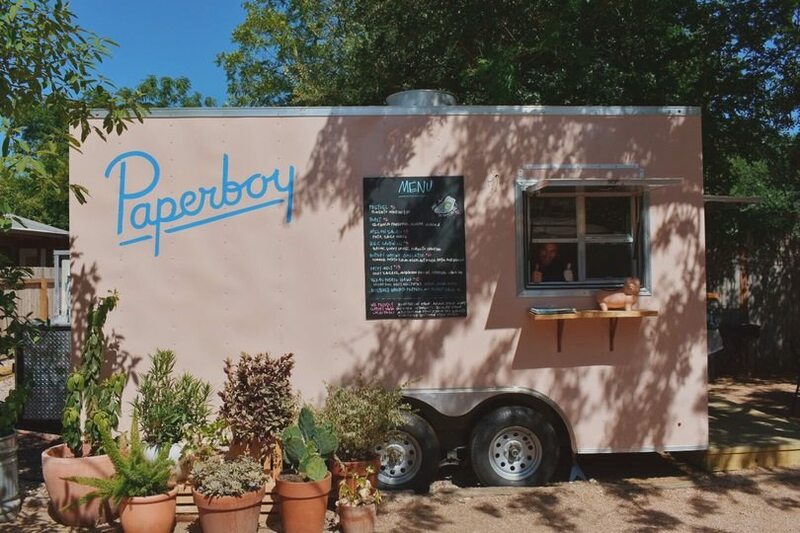 Paperboy is the other food truck with equally enticing options. Potato hash with a poached egg and toast with ricotta and peaches were the picks we made. All the food was incredible. I’m from Central Pennsylvania where food trucks are still a new concept so this was extra fun for me. Sitting at a picnic table under a large canopy we finally had our Texas Barbecue experience. Meg opted for a sliced brisket sandwich and a blue cheese cole slaw. She took approximately 3 bites before declaring it the greatest coleslaw ever! I opted for a half pound of perfectly cooked ribs and potato salad. Kerlin BBQ has excellent food and we skipped the day long wait at some of the more well known spots. 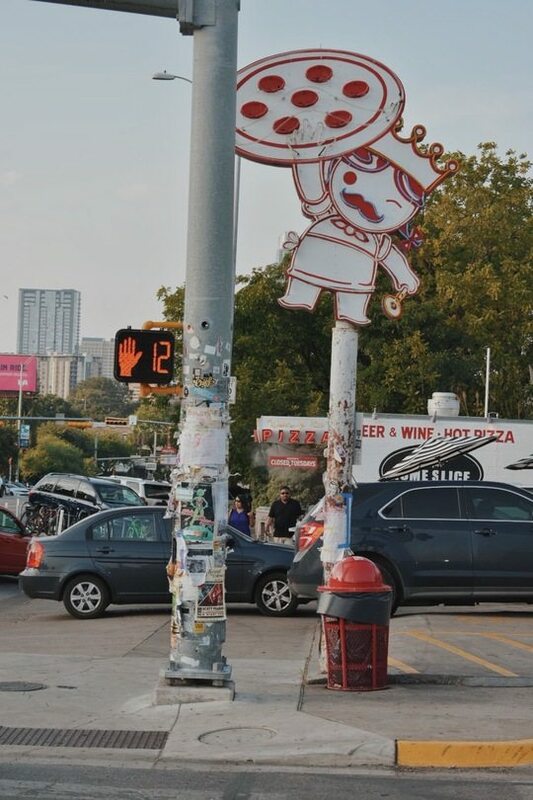 Torchy’s is a casual mid range restaurant and an Austin institution. 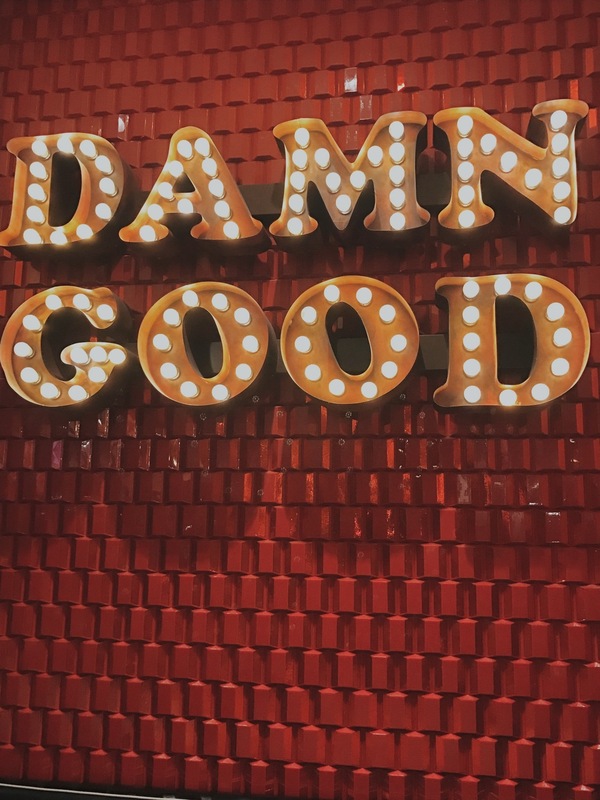 A trip to Austin isn’t complete without stopping by Torchy’s for a trio of tacos. Try the green chile queso for a Torchy’s twist on a classic appetizer. 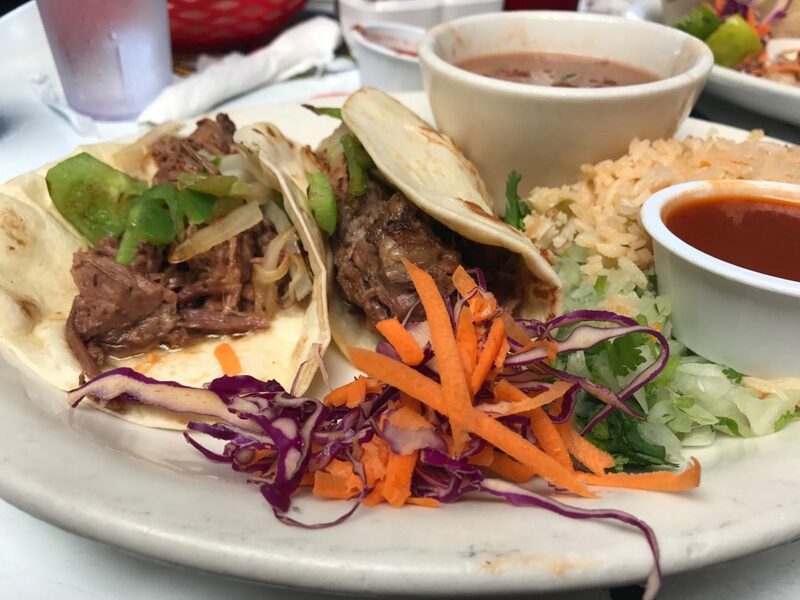 For your entree try three different tacos because let’s be honest the fun is in the choices. The Trailer Park is made with hand battered fried chicken with chilies, lettuce, pico de gallo on a flour tortilla. I loved The Crossroads which came with smoked beef brisket, grilled onions, jalapeños, fresh avocados, cheese and tomatillo sauce. Again, so much for the whole no tacos thing. We met up with our friends Melissa and Constance from Lez Backpack for Sunday brunch. Meg met them while she was teaching in Seoul South, Korea but they are Austin locals. It was great to catch up and they gave us some great Austin tips. Chicon was adorable and stylish with delicious food. I opted for a burger and fries ($14) and Meg went for the avocado toast ($10). They also have $2 mimosas every Saturday and Sunday! Our last day in Austin was Meg’s 30th Birthday. I was feeling the pressure about finding a great restaurant, luckily for me, I found Eberly. It is upscale without being pretentious and the food was incredible. The whole fancy food means small portions joke definitely did not apply here. Meg ordered the Yellowfin ($27) and I had the Braised Short Rib ($25). We also shared sides of blue cheese potatoes and roasted brussel sprouts. The meal and the service were great. A place we would recommend over and over again. Located on South Congress near our hotel the smells of pizza had been drawing me in for days! Our last night there I finally gave in to the craving. Home Slice is serving up big NY-style slices with a variety of toppings until 3 am on the weekends. They offer both a dine in and a carryout option. I opted for a pepperoni slice with a coke and it was everything I had hoped for. Austin Pride is at the end of August each year and attracts major headliners for performances. While we were in town we saw advertisements for Betty Who and Bianca Del Rio all over town. 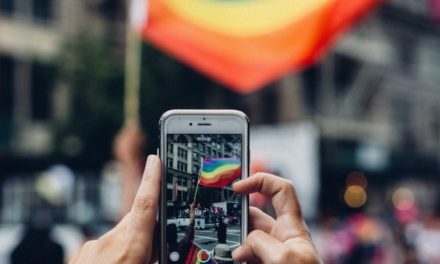 Check out their guide to Pride 2017 for specific parties and events. You can’t write about Austin without talking about SXSW – you just can’t. SXSW is an annual conference meets festival meets – well just pure coolness. They focus on film, interactive media, and music that takes place in mid-March. 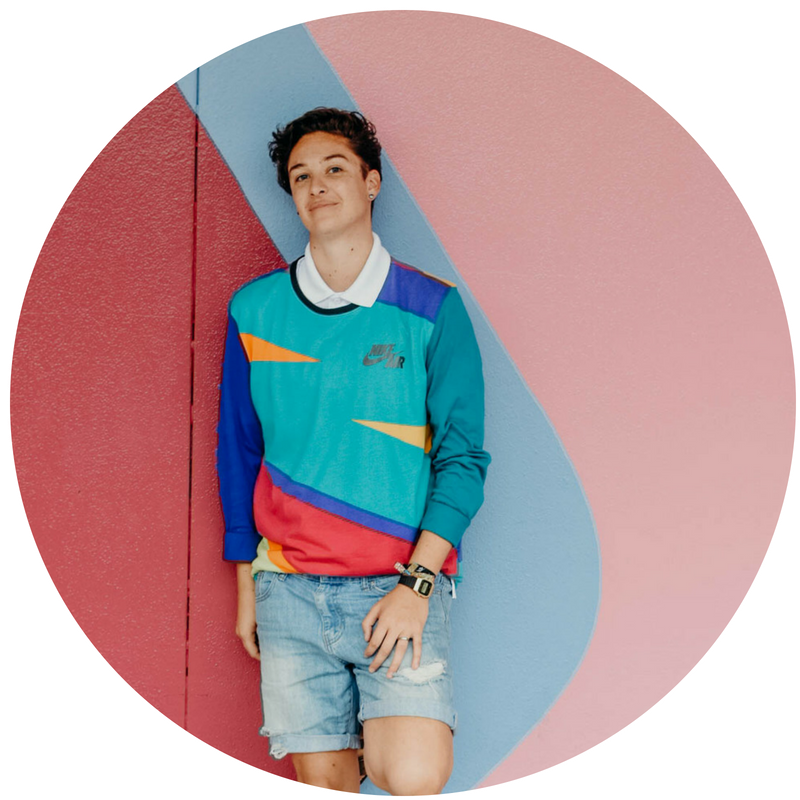 Our friends over at DapperQ speak each year about queer fashion on a panel. 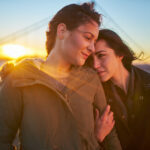 As a whole, the conference does a great job emphasizing LGBT themes. Austin City Limits takes place over two weekends in mid-October and hosts over 140 live music acts. You’ll see performances from Chance the Rapper, Jay Z, OAR, Red Hot Chilli Peppers and The Killers – casual. I’m ready to book my ticket back to Austin just for this event. 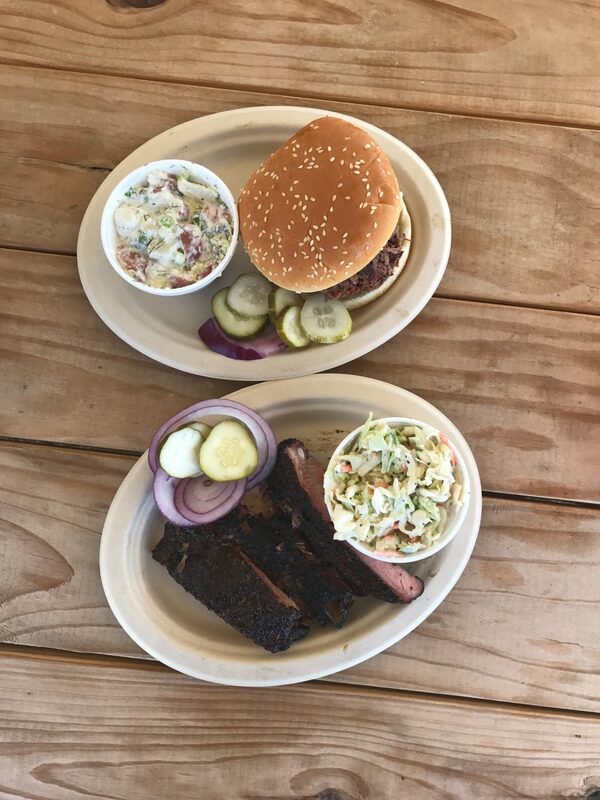 La Barbecue is an LGBT owned Barbecue spot is considered one of the best in Austin. They are serving up grass fed, locally sourced beef. The brisket is cooked low and slow so it melts in your mouth and they have some creative sandwich options. Expect the meat to be more on the savory side with a sweeter sauce available on tables. Also, the pickles, don’t skip the pickles. Meg has a soft spot in her heart for bookstores. She calls them her happy place. South Congress Books fit the bill perfectly. Duck in to browse the shelves of new and used books. 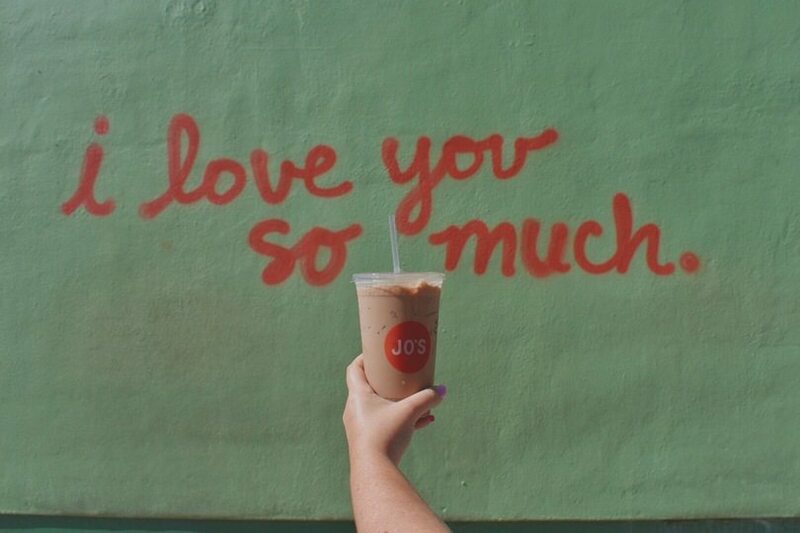 Meg had the best-iced coffee of her life at Jo’s Coffee. It was called a Turbo and it’s made with a cold brew, cream, chocolate and hazelnut syrup and tastes like sweet heaven. 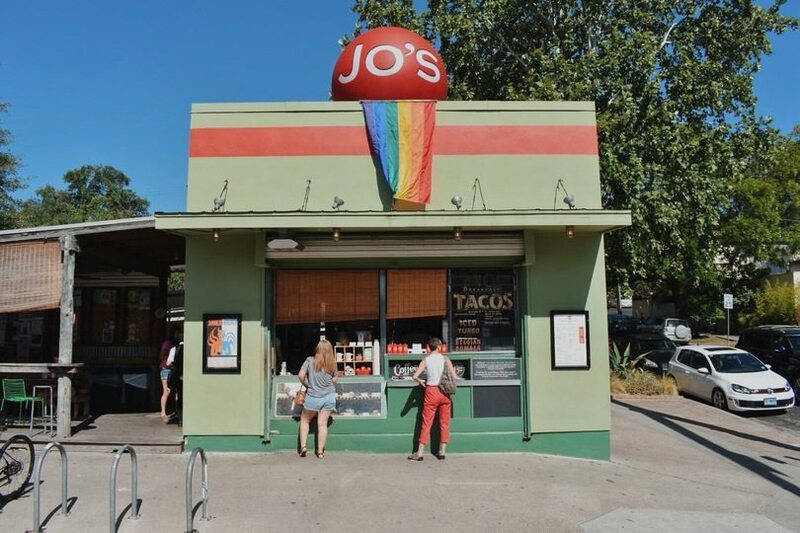 You’ve probably seen Jo’s on your news feed because it’s home to one of the city’s most famous street art landmarks. The moment we checked into our hotel we knew we were in good hands. There were rainbow flags or rainbow welcome stickers on a majority of the businesses in South Congress. 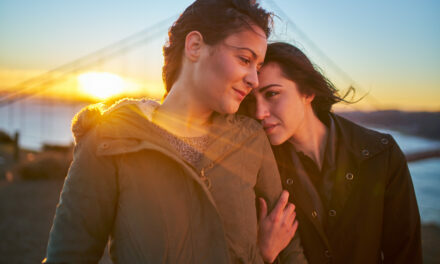 While Austin doesn’t have a concentrated LGBT area like many cities do, that might be because LGBT folks are included in mainstream locations. Austin has dozens of LGBT Meetup groups literally everything you can think of from sports based meetups to anime meetups. They also have a local LGBT youth center. 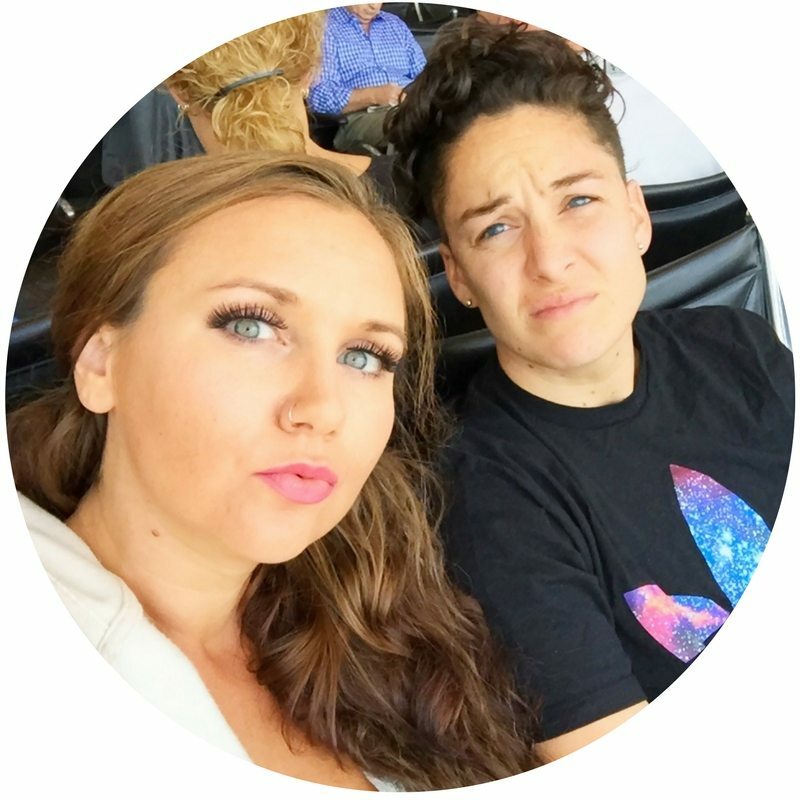 The Austin Gay and Lesbian Chamber of Commerce is a great resource for LGBT inclusive businesses.